Messiah Lutheran Church is located at 2092 Knox Road 150E Galesburg, Il 61401. 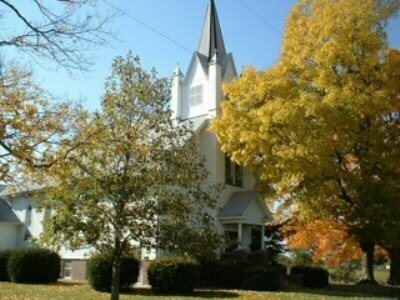 In 1870 in Henderson Grove was the beginning of the Messiah Lutheran Church. A small group of consecrated and determined men and women and children came together to worship and establish this congregation. Even though they had no resident pastor for many years to come, they were eager missionaries. The synodical minutes show that within two years the membership had increased to fifty communicants and eighty children. In 1871 ten members were received on confession. The report for 1876 was one hundred and sixteen communicants; two hundred and twenty-seven with the children. There were sixteen baptisms that year. At no time since has there been so great an increase in the church. Many Pastors and members have come and gone over the years and our church still stands strong and our congregation is like family. 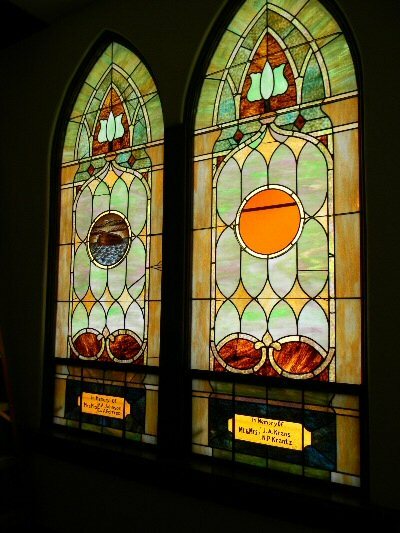 Many additions and improvements have been made but one thing that will never change are our beautiful stain glass windows throughout the church. Our service begins at 10:00am every Sunday. Sunday school is 10:30-11:15, we go downstairs directly after the children's sermon during the service. We would be blessed if you would like to join our close family-like congregation or if your children would like to become a part of our wonderful Sunday School. Click on the links to the left and take a look around! There you are sitting in worship or Bible study. Your child, or toddler, is restless. Perhaps they’re even a little rowdy. You try to silence them, and nothing. You try to pacify them with food or toys, and nothing. Eventually, you resort to the last thing you wanted to do: you pick them up, and before a watching audience, you make the march out of the auditorium. All the while, you’re feeling a little embarrassed. Maybe you’re a little frustrated too. 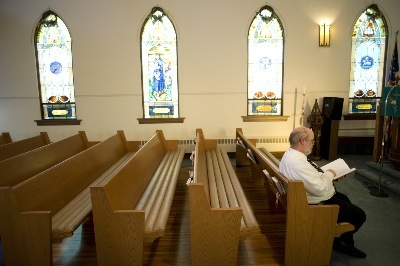 You might even think to yourself, “There’s no point in coming to church. I get nothing out of it because I have to constantly care for my child. I want you, you mothers and/or fathers, to know just how encouraging you are to so many! The little elderly woman who often feels alone beams with a smile at the sight of you wrestling with your little one. She’s been there before. She knows how hard it can be, but she smiles because to hear that brings back precious memories. To see young parents and their small children brighten her day, and she may have just received bad news this week about her health, but seeing the vitality of young ones removes, if but for a moment, her fears. The older man who always seems to be grouchy notices you too. He’s always talking about how children in this day have no respect or sense of good. But, he sees you, a young family, in church, and you don’t miss any gathering. Like clockwork, he can depend on the sight of you and your young family. You give him hope that maybe the church isn’t doomed after all, because there are still young parents who love God enough to bring their restless children to worship. The family who’s unable to have children notice you too. They’d love to be in your shoes, but for whatever reasons, they are unable to bear children. They’ve thought about adopting, but they’re not sure if that’s what they want to do or if they will keep on trying to have children of their own. They’d love to talk to you for a little while about the joys of your children. They need you!! Then there’s everybody else. Yes, some people will honestly become frustrated by noisy children in church. They have this WARPED idea and notion that reverence includes absolute silence. IT DOESN"T!! When parents brought their children to Jesus, the disciples rebuked them (Matt. 19.13-15), but Jesus rebuked His disciples. He said, “Let the little children come to me and do not hinder them, for to such belongs the kingdom of heaven." The term translated “children" in Matthew and Mark is paidon. The root of the word “pedagogue" is from this word. It defined children of either an infant state, or more particularly, it was with reference to those who were half-grown and could be either males or females. When Luke wrote his account of this narrative, he used the word brephos; which means “infants." Luke wasn’t contradicting Matthew and Mark’s account, because Luke wrote that they brought the infants “also" (Luke 18.15-17). They would have squirmed, maybe even cried. This was likely why the disciples rebuked the parents; as well as that they might have thought that the children were too young to understand the blessing Christ pronounced over them. Bring your children to church. IF YOU DON"T HEAR CRYING, THE CHURCH IS DYING!! As hard as it might be for you as a parent, keep on doing what you’re doing!! I love you and your crying children! You are an encouragement, and you’re starting off your children’s lives as you should!